The ferrous metal is heated to the austenite phase, above the transformation range, and is subsequently cooled in still air at room temperature. The normalizing heat treatment balances the structural irregularities and makes the material soft for further working. The cold working operations such as forging, bending, hammering hardens the materials and make it less ductile. Same goes for heat affected area near welded portion. The normalizing heat treatment can re-gain the ductility and softness of this material. This treatment is also used as before any subsequent surface hardening to improve response to the desired hardening. The metal is heated in a furnace for normalizing heat treatment process. The temperature of the furnace is kept between 750-980 °C (1320-1796 °F), depending upon the carbon content in the material. The material is kept at the temperature above austenite temperature for 1-2 hours, until all the ferrite converts into austenite, and then cooled to room temperature in still air or Nitrogen, if run in the vacuum furnace at less than 1 bar pressure. The solubility of carbon in iron is higher in the austenite phase. Normalizing heat treatment produces a more uniform carbide size which aids further heat treatment operations and results in a more consistent final product. The process of normalizing is explained in following. The metal is heated from temperature “a” to “b” and kept in this condition for some time. It is then cooled to ambient temperature “d” in still air. Carbon steel contains carbon in the range of 0.12 to 2%. As the percentage of carbon content increases, the steel becomes harder, tougher and less ductile. Low carbon steels usually do not need normalizing. However, they can be normalized on the requirement. The period of holding temperature is one hour per 25 mm (0.984 in) thickness. The process ensures that all the steel transforms into austenite. Steel is then cooled down to ambient temperature in still air. This process produces fine pearlite structure which is more uniform. Pearlite is a layered structure of two phases i.e. cementite (iron carbide) and α-ferrite. This process is different from annealing because in the annealing the heated metal is cooled slowly at a specified rate inside the furnace. Normalized steel has greater strength and hardness than annealed steel, and the process is more economical due to cooling directly with air. The thickness of carbon steel can have a significant effect on the cooling rate and thus the resulting microstructure. The thicker pieces cool down slower and become more ductile after normalizing than thinner pieces. After normalizing the portions of steel containing 0.80% of carbon are pearlite while the areas having low carbon are ferrites. The redistribution of carbon atoms takes place between ferrite (0.022 % by wt.) and cementite (6.7% by wt.) by the process of atomic diffusion. The amount of pearlite is more than that in annealed steel with same carbon content. 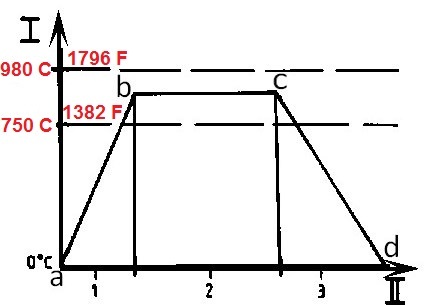 This is because of shifting of the eutectoid composition to lower value and formation of cementite. The fine-grained pearlite microstructure is tougher than coarse-grained ones. 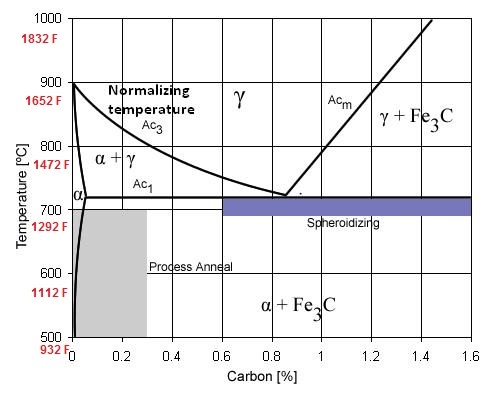 Normalizing reduces the internal stresses of the carbon steel. It also improves microstructural homogeneity, enhances thermal stability and response to heat treatment. The equipment in use for normalizing comes in both batch and continuous operations. Bell furnace offers an economical method of heat treatment and different bell lifting mechanisms. Continuous furnaces heat treats the metal in the continuous fashion. The conveyor runs at constant speed, and the product is carried to desired conditions after heat treatment.